Open for new members this spring, this is a structured program for deeper study and practice of Dharma. We meet most Sunday afternoons, beginning February 17, with an Introductory Program at 12 noon. Other times to be determined, and missed classes can also be made up online. There are certain commitments, such as to take examinations on each section, and to engage in some retreats on the Four Great Preliminary Guides: Refuge and Bodhichitta practice, Purifying Negative Karma and Obstacles, Mandala Offerings and Guru Yoga. Alternatively, participants can opt to take the course without these commitments, but with the intention to attend regularly. This program is for students with sincere interest and experience in our Center or other Mahayana Buddhist study and practice, and students need to become monthly sponsors at the FP level. 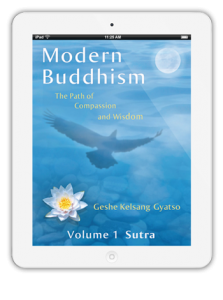 We will study a new book, Oral Instructions of Mahamudra, by Venerable Geshe Kelsang Gyatso, Rinpoche.